Robert Lambert returns to the Panthers team today. Joint boss Carl Johnson has urged the Peterborough public to back Panthers’ title bid. Johnson is hopeful of a bumper turnout for a clash of the Premier League titans at the East of England Showground today (August 9, 5pm). His Panthers will men attempt to beat table-topping title rivals Edinburgh for the second time in three days and secure one of the two victories Johnson feels will secure a play-off spot. They produced a terrific 45-44 success over the reigning champions in Scotland on Friday night and Johnson has set his sights on completing a weekend double. He said: “It was a fantastic effort to win up at Edinburgh on Friday night, but we are well of the fact we can’t undo our good work there by slipping up today. “It is important we pick up another win because we want to get a play-off spot secured as soon as possible. I feel we are only two victories away from doing that. “I feel sure it will be another humdinger of a meeting with very little between the two teams – just as was the case on Friday. “These are exciting times for the club. The racing has never been better and we have a terrific team in with a real chance of challenging for the title. Panthers call in Rye House man Luke Bowen to guest at reserve in place of the injured Simon Lambert. 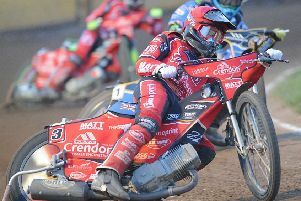 World Under 21 finalist Emil Grondal returns after missing the triumph at Edinburgh due to a fixture clash in his native Denmark. It will again be rider replacement for injured skipper Ulrich Ostergaard. Edinburgh bounced back from their Friday loss with a 52-40 triumph at Rye House last night (Saturday). They lead the way from Scottish rivals Glasgow by virtue of a superior points difference with Panthers six points adrift in third. Panthers possess meetings in hand on both teams and can slash that gap this evening. Johnson added: “Edinburgh having a meeting last night was no bad thing as far as I am concerned. READYPOWER PANTHERS: Lewis Blackbird, Luke Bowen (guest), Emil Grondal, Rafal Konopka, Robert Lambert, Rider replacement for Ulrich Ostergaard, Michael Palm Toft. EDINBURGH: Robert Branford, Max Clegg, Craig Cook, Rider replacement for Sam Masters, Erik Riss, Justin Sedgmen, Kevin Wolbert.